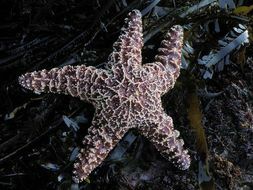 Marine scientists have undertaken the difficult task of replacing the beloved starfish’s common name with sea star because, well, the starfish is not a fish. It’s an echinoderm, closely related to sea urchins and sand dollars. 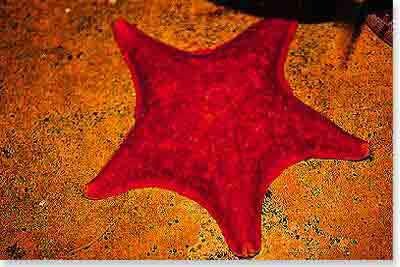 Beyond their distinctive shape, sea stars are famous for their ability to regenerate limbs, and in some cases, entire bodies. 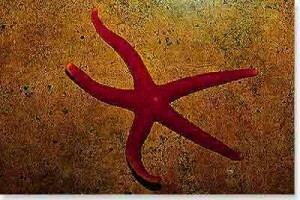 They accomplish this by housing most or all of their vital organs in their arms. Most sea stars also have the remarkable ability to consume prey outside their bodies. Using tiny, suction-cupped tube feet, they pry open clams or oysters, and their sack-like cardiac stomach emerges from their mouth and oozes inside the shell. 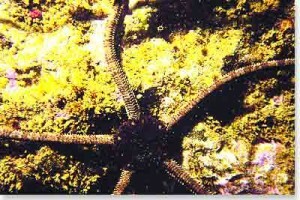 The stomach then envelops the prey to digest it, and finally withdraws back into the body. 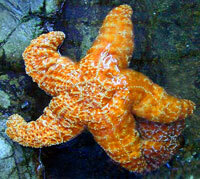 Below are examples of sea stars you might find in the Doheny tide pools and on the harbor breakwater.